Prussian G8 0-8-0 BR55-1666 at Finnentrop on 12/3/46. Photo G.E. Rabone. One of the hazards of writing a blog is that sometimes the material that I come across during my researches turns out to be more gripping than the intended subject of the post. While looking for a map of Berlin’s railways before Germany’s reunification I came across a map of the city’s railways as they were just after the end of WWII. Then the map suddenly vanished, returning the dreaded 404 ‘Page not found’ error. Further poking about with the URL in an effort to recover the map lead me to Steve Rabone’s website. Here there is much to delight the railway enthusiast including Steve’s own railway modelling in ‘S’ gauge and the former MR station at Hellifield. However, the real gem is On Her Majesty’s Service, an on-line copy of a small book written by Steve’s father, G.E. Rabone, in 1983 about his gricing in Germany between April 1945 and January 1947. Having stumbled across the book by accident I stayed up half the night and could not stop reading until I reached the end when Steve’s father returns finally to England. This is primary historical material at its best. G.E. Rabone was part of a small RAF radar unit and his movements around Germany – both official and unofficial – gave him plenty of scope to record the situation on the railways of Germany and the country as a whole. The writing is concise and to the point. Steve’s father does not dwell on the destruction wreaked by the war, but he does not ignore it either. Here is part of his account of a visit to Hamburg. At first sight Hamburg seemed relatively little damaged. There was of course plenty of explosive bomb damage but then the fine, upstanding apartment buildings (found in the centre of almost all German cities) which looked undamaged, were seen, close to, as mere shells. The city centre had been burnt-out by fire-bomb air-raids, especially during one horrific raid and fire storm on the same August weekend in 1942. The railway descriptions are equally pithy. Steve has scanned his father’s notebooks so if the reader is so inclined the locomotive numbers can be matched to the text. Minden, 9kms to the west. Fifteen derelicts were stored at the shed, two BR 50, three BR55, two BR 17,four BR 58 and a modern Polish 2-10—0 of class Ty23; over 400 of these were built in the 1920s and 1930s. There was also a small American-built 2-8-0 of Polish class Tr20, taken over by the DRG like the previous engine in 1941. If you enjoy BTWT, you will enjoy On Her Majesty’s Service. You can read the whole book by following the link below. A group of boys vandalise a train and post a video of their exploit on You Tube. Oliver Fricker, 32, a software consultant from Switzerland has been sentenced to five months in jail and three strokes of a cane for breaking into a railway depot and spray-painting graffiti on a train in Singapore. Amnesty International called the sentence barbaric. We think the man got of lightly. Vandalism in Singapore can be punished with a fine of S$2,000 ($1,437) or up to three years in jail, in addition to three to eight strokes of a cane. Least readers think after reading the last post that I’m an old fashioned dinosaur who cannot keep up with the pace of modern life, here is a temporary art installation on the Berlin Metro that I thoroughly approve of. Just imagine what this idea could do for the Wasaw Metro or London Underground? Yes, I know it’s only a Volkswagen ad. But that doesn’t stop it being a brilliant idea! With a hat tip to Going Underground’s blog. A development vision prepared for the Railway Museum in Warsaw. Sketches Chief Executive’s Office Government of Mazowse Province. The dispute between PKP SA and the Railway Museum in Warsaw continues. A short-term deal has been agreed allowing the museum to remain on its current site adjacent to ul. Towarowa for another three years. The museum has lost its rent free status and is obliged to pay rent for its occupancy of the site – though not at the level originally demanded by the landowners, PKP SA. The dispute concerns the long-term location of the museum. PKP SA want the entire former Warszawa Glowna station site cleared for development and have suggested a number of alternate locations both within and outwith Warsaw’s city limits. The museum’s management team want to remain on the existing site. In order to convince PKP SA’s estate department that the development of the land and the development of the museum could go hand in hand on the existing site the Museum authorities have commissioned a design team to prepare some visualisations of what such a hybrid development could look like. But the railway company’s estate team are far from convinced and a spokesman pointed out that the PKP SA is sticking to its demand that the museum vacates the Warsawa Glowna site by 2013. It seems that PKP SA’s estates chief Pawel Olczyk and Railway Museum director, Ferdynand Ruszczyc, are playing a game of musical chairs with both bosses counting on the fact that nether will be in post when the 2013 deadline expires. A deal to secure the long-term future of Poland’s de facto national railway museum will require courage and out-of-the-box thinking from all concerned. Until that happens the future of the museum and its priceless collection will remain in jeopardy. 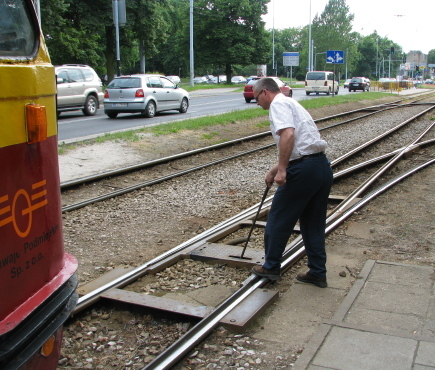 Metre gauge tram line junction less than 4 miles from Lodz city centre. Photo BTWT. 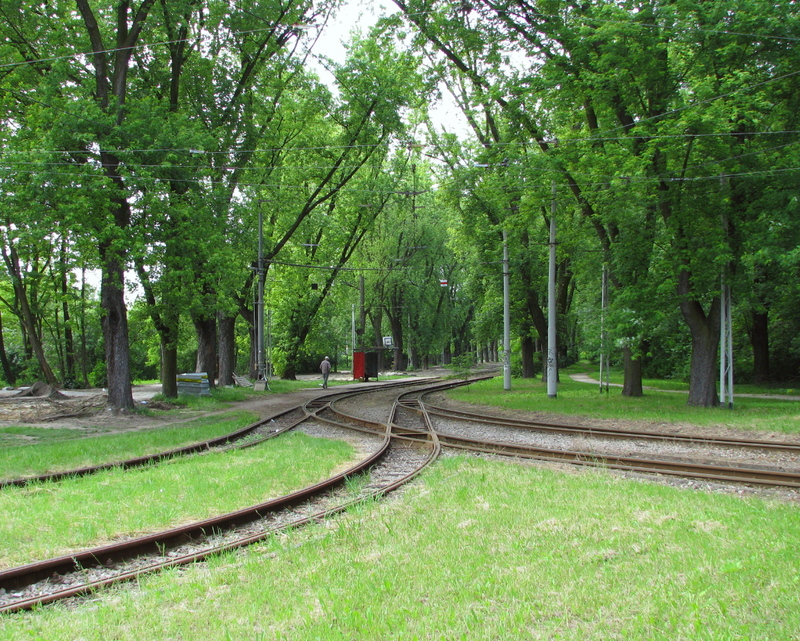 The picture above (looking North) was taken on 20 June 2010 at the boundary between the Lodz Miejskie Przedsiębiorstwo Komunikacyjne (Lodz City Transport Department) tram system and the tracks run by the Tramwaje Podmiejskie Sp. z o.o. (Suburban Tramway Company). The right hand curve is used by the MPK service no.9 and leads to the terminal stop and loop at Zdrowie. The left hand curve is used by TPS works cars when returning to their depot. Another photo taken the same day at the boundary point this time looking West. While TPS drivers have to switch the points by hand, MPK drivers have infra red remote controllers to perform the same task. Map showing (top right hand corner) the junction and boundary point at Zdrowie. The left hand curve (used only by TPS works cars) is not shown, nor are all the the tram stops. OpenStreetMap is a collaborative project to create a map of the whole world. Let’s save Poland’s old railway stations! 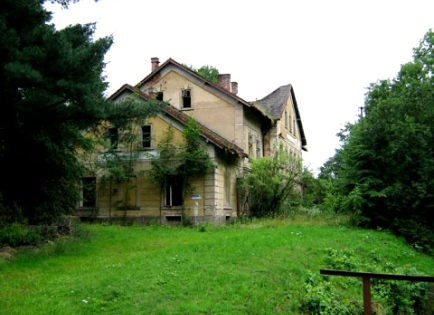 A remarkable survivor, the unique railway station in Budwity. Although Poland’s railway heritage continues to decay at an alarming rate, a conference that took place in Olsztyn on 23 March this year was possibly a sign that the tide of public opinion may be beginning to turn. The upbeat conference slogan ‘Uratujmy Stare Dworce’ (Let’s save Poland’s old railway stations) reflected the campaign aims of its principal organiser, Elzbieta Mierzynska. Ms Mierzynska is a professional journalist and the daughter of a railwayman. Her campaign is focused on the Warmia and Mazury province which has 193 railway stations of which only 30 are in use. The conference attracted a distinguished panel of speakers including: Marian Podziewski, Voivod (central government representative) of Warmia and Mazur; Zbigniew Maj, representing the Ministry of Culture and National Heritage; Paweł Olczyk, main border member PKP SA (responsible for Property); Adam Neumann, Director Gdansk Region (new PKP subsidiary) Dworce Kolejowe PKP; Michal Wrzosek, Spokesman, PKP SA; Jacek Przesluga, main board member PKP SA (in charge of railway station renewal); Barbara Zalewska, historic monuments registrar of Warmia and Mazur ; Janusz Piechocinski, vice chairman Parliamentary Infrastructure Committee; and Jacek Wysocki, of the Warmia and Mazury Structural Planning Department. Delegates heard two interesting case histories, the first by Jolanta Piotrowska, the mayor of Gizycko, on how her town council had managed to take over the local railway station; the second by Antoni Smolak, the Chief Executive of Maldyty Municipality, on the problems preventing his council from taking over the historic railway station at Budwity. Let’s hope that the attendance of so many key decision makers at the conference will mean that some real progress will be made at last. We hope to interview Ms Mierzynska shortly. Goniadz station in 2007. Photo M Lenka. Crafting posts for BTWT follows a logical pattern. The story comes first. Then comes the hunt for the header picture. Sometimes it is difficult to find a suitable photo and Google is pressed into service, sometimes one is spoiled for choice. Today’s post started as a search for photos to illustrate an article about how Poland’s state railway company, PKP SA, forming yet another daughter company. The new company will manage Poland’s biggest railway stations. Yet somewhere along the line I became distracted. I came across some interesting photos on M. Lenka’s Dla Przyjaciol blog and discovered her pictures of stations between Bialystok and Elk. Remarkably the passenger service between the two towns – some 6 trains a day – is still running. Her pictures illustrate the sad plight of so many of Poland’s railway stations, boarded up and decaying. One good picture is worth a thousand words, so click on the header picture now and see the rest of her photos. Surely somebody in a senior position in PKP could come up with a scheme to get the local communities involved in looking after their local railway stations? The UK’s community rail partnerships immediately come to mind. Sadly when a local group comes up with an initiative PKP officials seem determined to destroy the enthusiasm that motivates the volunteers. In March, a scout troop worked hard to earn enough money to buy paint and tools, then they gave up a whole weekend to paint the inside of Swiebodzice station. They made some enlargements of old postcards which showed the early history of the Wroclaw Swiebodzki-Swiebodzice railway line and put them up on the newly painted walls. The local mayor applauded the scouts’ efforts and provided funds to buy some new benches. And PKP? They sent the scouts a bill for the use of ‘advertising space’ on the station premises. Rolling stock at Piotrkow yard awaiting disposal. The Piotrkowska Kolej Dojadowa (Piotrkow Narrow Gauge Railway) should really have been saved. Amazingly the whole track survived until 2006, though certain road crossings had been asphalted over before then. The history of the 750 mm gauge line spanned the 20th century. Construction started in 1900. The driving force was Count Stanislaw Psarski who had a limestone quarry and lime kilns near at Sulejow and needed a way of transporting coal from the standard gauge goods yard at Piotrkow Trybunalski and taking quicklime back in the reverse direction. Count Psarski obtained a construction permit signed by Tsar Nicholas II and the line opened for passenger traffic in early October 1902. The line prospered, carrying commuters and schoolchildren from outlying villages into Piotrkow, and in the summer holidaymakers and day trippers from Piotrkow into the wooded countryside near Sulejow. By the 1970s, competition from buses began to bite into passenger revenues. However both passenger and freight revenues were to received a boost in 1975 when the River Pilica was dammed creating a large artificial lake and Europe’s largest coal fired power station was constructed at Belchatow. The lake increased the attraction of the Sulejow area to tourists and the power station needed large quantities of Sulejow quicklime for use in its flue gas desulphurisation filters. Regular passenger workings were suspended in 1986 and freight carrying in 1989. Apparently after abandoning communism the authorities decided that flue gas desulphurization was an expensive luxury that Poland could no longer afford! In 1990, the Towarzystwo Kolejki Waskotorowej Piotrkow-Sulejow (Piotrkow – Sulejow Railway Society) was formed with the objective of running the line as a tourist railway. The Society obtained a license to operate the line directly from PKP without the intermediary step of control of the line being first vested in a local authority. 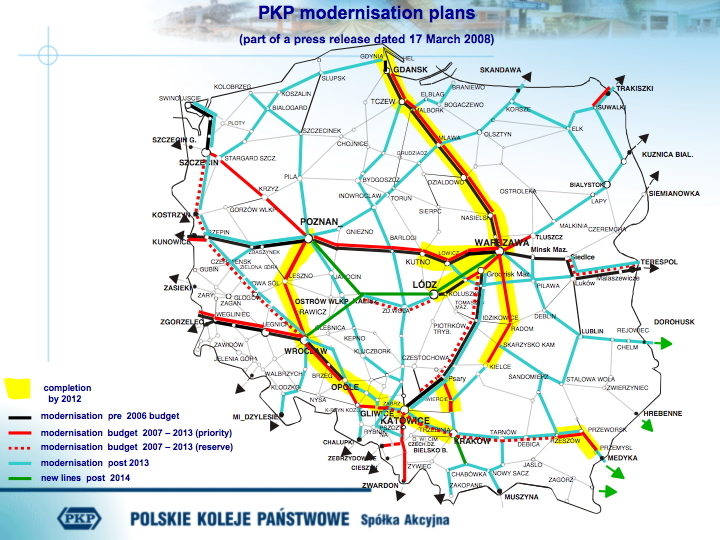 (The latter method subsequently became the norm for preserving ex PKP lines.) The TKWPS were fortunate in being able to take over a railway in working order. However, in a country conditioned by 50 years of authoritarian rule, ‘bottom up’ initiatives were not exactly welcomed. The society were soon in conflict with the various road authorities who started pouring asphalt over the road crossings. The society members, mostly former and serving railwaymen, set out with their picks and shovels to clear the flangeways, but this only made relations with the local authorities worse! It is easy to be wise after the event and to diagnose that the society should have embarked upon a charm offensive to bring as many of the local authorities as possible on board. However, looking at problems faced by other operators elsewhere, one had to admit that maintaining good relations with local authorities has never been easy for Poland’s preserved railway operators. In the end, the society managed to clear a 6 km stretch of line from the standard gauge interchange at Piotr Tryb Wask to Jezioro Bugaja, a recreational lake on the outskirts of Piotrkow. Tourist trains were operated on special days such as Children’s Day and Piotrkow Day. By now the railway society were receiving threats from the local authorities who claimed that the trains were operating illegally. 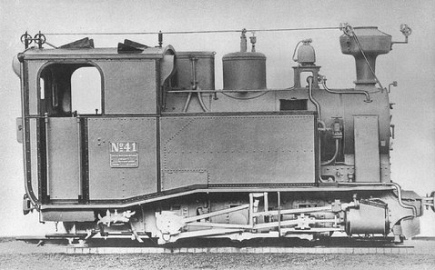 The tense situation led to fractures within the society which were exacerbated when some members acquired – and then scrapped – an Ol49 standard gauge steam locomotive. The recent history of the line has already been described on BTWT. For a time it seemed that a Skansen might be created at Piotrkow Tryb Wask. But it seems that these plans too have come to naught. PKP Estates Department in Lodz has announced that the remaining rolling stock will be disposed of by tender. For those interested in preserving their own bit of the PKD, here is a list of the rolling stock being sold. Guideline prices are shown in the right hand column. Tenders wil be opened on 22 June. The Jonsdorf – Zittau – Friedland railway. The Koniglichen Sachsischen Staatseisenbahnen (Royal Saxon State Railways) was once the operator of the largest narrow gauge railway network in Germany. At its zenith, shortly after WW I, the network covered some 500 km (311 miles) of route. After WW II, the eastern-most line of the system – linking Jonsdorf and Oybin via Zittau to Friedland – found itself in East Germany, Poland and Czechoslovakia. Sadly the Polish and Czechoslovak sections did not survive into the era of railway preservation and EU financed projects. The section left in former East Germany has survived and is a well known steam-operated tourist line, the Zittauer Schmalspurbahn. The Polish and Czechoslovak sections are closed and largely forgotten. Our guest writer Inzynier tells the line’s story. By 1875 the basic Royal Saxon State standard gauge railway network was already in place. Because of the difficult nature of the hilly terrain, further expansion of the standard gauge railway network was ruled out, the likely traffic on such lines did not warrant the cost of construction. The narrow gauge was chosen as an economic means of reaching these areas. The first 750mm gauge railway in Saxony opened in 1881 from Wilkau to Kirchberg and further lines soon followed, with Freital-Kipsdorf being the next line to open, in 1883. That year also saw construction commence on what was to be the most easterly of the Saxon narrow gauge lines, from Zittau through Reichenau (now Bogatynia) to Markersdorf (now Markocice) near the border with Bohemia, then part of the Austrian empire. The first trains ran on this 13.5km railway on 22 October 1884 and the line was officially opened on 11 November. The locomotive depot and headquarters of the railway were at Reichenau, the initial timetable showed three trains each way and the freight traffic consisted of coal, timber building materials and consumer goods. On 24 November 1890 a new 750mm gauge railway opened from Zittau to Oybin (10km) with a 4km branch to Jonsdorf. Although the new line shared the state railway station and 1.7km of the line to Reichenau it was the only narrow gauge railway in Saxony built by a private company, albeit operated by the state railway and fully nationalised in 1910. In November 1898 an agreement was signed with Austria which provided for a 2km extension of the state railway from Markersdorf to Hermsdorf on the border, while in Bohemia a 10.6km line was to be built from Hermsdorf to Friedland. Earthworks commenced in July 1899 and the new lines (with reversal necessary at Dittersbach) opened on 25 August 1900. The Hermsdorf-Friedland line was the only section of 750mm gauge in the Austro-Hungarian empire (the 760mm ‘Bosnian’ gauge being the norm) and the only application of the Heberlein braking system. However, all trains terminated at Hermsdorf, with passengers required to board another train if wishing to travel onward beyond the border. Freight wagons – it is thought around 25 per day – were the only vehicles to actually cross the border, after customs formalities had been completed. Bogatynia Station and Saxon State Railways IK class locomotive. Photo via Bogatynia Reichenau website. Facilities are believed to have been introduced on the German section before the First World War to allow standard gauge wagons to be transported, but on the Austrian section the track was too light for such traffic. The First World War brought the collapse of the Austrian empire and the Hermsdorf-Friedland section now lay in Czechoslovakia, with the termini becoming Hermanice and Frydlant; in 1924 the hitherto ‘local railway’ became part of the state railway, CSD. The Zittau-Hermsdorf section remained under German administration after the First World War, although the Saxon State Railways became part of DR. In 1921 a 4km branch was built from Reichenau to Seitendorf by the Kohlenbahn-AG Reichenau (Sachsen) – a sign of things to come in this region. In 1938 Germany occupied much of Czechoslovakia and, although the whole of the Zittau-Reichenau-Hermsdorf-Friedland line was now controlled by DR, operations changed little and there were still no through trains across the former border. The 1944 timetable featured up to six trains each way per day between Zittau and Reichenau, seven between Reichenau and Hermsdorf and five between Hermsdorf and Friedland. Saxon State Railway 41 ex works at the Sächsische Maschinenfabrik in Chemnitz. The end of the Second World War saw the end of the Zittau-Reichenau-Hermsdorf-Friedland railway. Czechoslovakia emerged again and traffic across the border at Hermsdorf/Hermanice ceased on 2 May 1945. The borders of Poland were moved, with the western border being drawn along the Oder/Odra and Neisse/Nysa rivers. The Zittau-Reichenau railway crossed the Neisse/Nysa river just east of Zittau so, while the Zittau-Oybin/Jonsdorf line remained in (East) Germany, the majority of the Reichenau line was now in Poland; the last train reached Reichenau (soon to become Bogatynia) on 22 June. In Germany a stub of the line remained in use to serve a coal merchant until 1961, while the 1.7km of route used since 1890 by trains to Oybin/Jonsdorf continues to serve that purpose and seems to have a secure future. In Poland the line was initially closed until, at least partially via the Kohlenbahn branch, it was extended by 6km from Bogatynia to a standard gauge interchange at Turoszow. Services between Sieniawka (close to the German border), Bogatynia and Turoszow commenced on 20 May 1951. The 1958 timetable showed seven trains each way per day between Turoszow and Bogatynia and eight between Bogatynia and Sieniawka. Passenger traffic between Bogatynia and Markocice (formerly Markersdorf, the original terminus) recommenced in 1959 but in 1960 the standard gauge was extended from Turszow to Bogatynia to serve a massive new opencast brown coal mine. Passenger services on the whole of the narrow gauge line ceased on 1 July 1961. Freight traffic may have continued under PKP until 1964 and some sections may have continued to be operated for industrial purposes connected with the mine after that. Derelict border station at Hermanice in the Czech Republic. Photo Bogatynia Turystyka w Gminie website. The section in Czechoslovakia initially remained in operation after the war, but traffic was light and services were suspended in 1947. Freight traffic resumed in 1951 to serve a stone quarry at Hermanice and passenger services recommenced in 1957. New diesel locomotives were introduced from 1958 but steam traction continued to be used until 1964; in that year freight traffic finally ceased due to the condition of the track. However, passenger trains continued to run until 1976 and the line was not officially closed until 1984, while the track remained in place until 1997. Returning to the section which became part of Poland, the Kohlenbahn had a number of locomotives and, although at least some of these found their way to the Kujawy system during the Second World War, it seems that perhaps six of the Kohlenbahn locomotives worked on the PKP Bogatynia line after the war. One of these, Budich 931 of 1943, PKP T3-1043 (later T4-1062) is now an exhibit at Sochaczew museum. The final demise of the PKP narrow gauge line was due to the extension of the standard gauge line to Bogatynia to serve the new mine and its employees. The impact caused by this mining on the route of the railway and the rest of the Bogatynia area can be seen by following this Railmap link. Brown coal mining causes enormous damage, with farms, roads and even entire villages being consumed by the excavation. It seems that much of the former route of one of Poland’s more interesting narrow gauge railways has disappeared into a dirty big hole in the ground. Tramwaje Podmiejskie articulated car waits in pl. Zwyciestwa, Lutomiersk on a quiet Sunday evening, 6.6.2010. Photo BTWT. The 43 tram service from Lodz to the sleepy town of Lutomersk is not Lodz’s longest tram route, but is undoubtedly the most attractive. It starts from a loop in Lodz’s western suburb, Stocki; runs along a pleasant single line section on its own right of way along a park; plunges through the centre of Lodz, running mostly in the street, then on its own right of way again; plunges under the Lodz – Kutno railway line and passes Lodz Zoo. 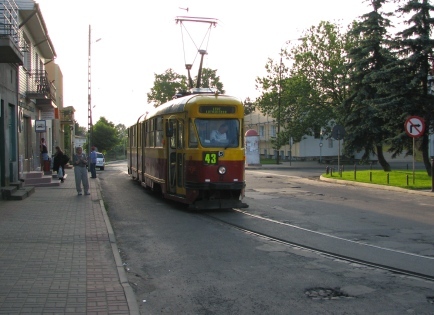 Up to this point, service 43 – run by Tramwaje Podmieskie, literally ‘Suburban Tramways’ – shares the tracks of Lodz’s municipal tram company, MPK. But once past Zdrowie, the tram runs along 14 km of rickety Tramwaje Podmieskie own tracks. This section of line, which like the rest of Lodz’s tramlines is metre gauge, reminds me of the narrow gauge gauge railway which once ran next to a road from Warsaw’s Wilanów to Piaseczno. The narrow gauge atmosphere is briefly suspended as the single line veers into the centre of a street in order to pass through Konstantynow. However, after a kilometre or so it reverts to its customary place next to the road. 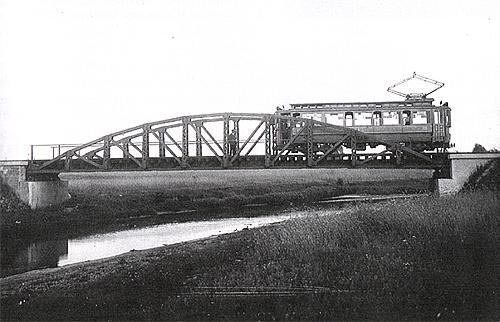 The girder bridge at Lutomiersk before WW II. The arrival at Lutomiersk is a worthy climax – on the outskirts of the town, the main road turns sharp left, but the tram follows a minor road sharp right. Then the line does a 90 degree turn to the left, leaves the road altogether and takes off across a field. A fine bow girder bridge takes the line across a sizeable river. A short road is reached. About here Google maps satellite view shows what appears to be a former dedicated route and the site of a former station just to the east of town square. Regardless of the truth of this hypothesis, these days the tram finishes its journey by looping the town square. If you like exploring obscure rural tram lines, then a ride on tram 43 is highly recommended! Lutomiersk. Satellite view Google Maps.